Is that skin rash eczema? Diagnosing eczema is not easy, and requires a visit to a physician. Only a physician can determine whether or not a skin rash is caused by eczema based upon the patient’s recent medical history and family history, as well as a physical examination of the skin rash. 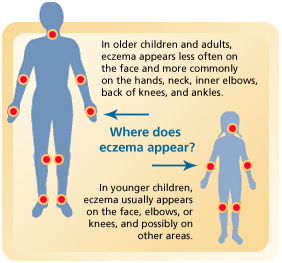 In the United States, eczema affects approximately 10 percent of the population. Atopic eczema (atopic dermatitis) — This type of eczema comes and goes repeatedly, and usually occurs in people who have a genetic (inherited) tendency to have allergies. In about 70 percent of cases, either the patient or a family member has allergic asthma, hay fever or food allergies. Atopic eczema appears early in life, usually in babies between 2 months and 18 months old. In babies, atopic eczema primarily affects the face, neck, ears and torso. It also appears on the tops of feet or the outside surface of elbows. Atopic eczema also is seen in older children, teen-agers and adults, where it usually involves the skin inside the creases of the inward bend of the elbow, knee, ankle, or wrist joints, the hands, or the upper eyelids. Contact dermatitis — When irritants touch the skin, they can produce two types of contact dermatitis. Irritant contact dermatitis is direct irritation of the skin. The problem is called allergic contact dermatitis when an allergic reaction occurs in the skin. Irritant contact dermatitis can be caused by prolonged contact with mild irritants such as bubble bath, soap, sweat, saliva, urine and even water. Allergic contact dermatitis only occurs in people who have an allergy to a specific substance. Each year, about 70 percent of people in the United States are affected by some type of skin allergy. The most common allergens are poison ivy, poison oak and poison sumac. Other common substances that trigger skin allergies include construction materials used to build homes and offices, cleaning products, deodorants, cosmetics and medications. Dermatitis of the earlobes can be caused by an allergy to earrings that contain nickel. Chemicals in fragrances, skin cream and lotions, shampoos and shoes or clothing also can cause allergic reactions. Hand eczema — This form of chronic eczema is limited to the hands. It can be related to atopic eczema or it can occur because of repeated hand washing or exposure to strong detergents. Occasionally, hand eczema is caused by an allergy, such as a latex allergy. Nummular eczema — This type of eczema causes round, coin-sized patches of irritated skin, typically on the legs, arms or chest. It usually occurs in adults. It can be related to atopic dermatitis and, less often, allergic contact dermatitis. In a few cases, it represents an allergic reaction to a fungal infection such as athlete’s foot. In this case, nummular eczema still appears typically on arms, legs or chest, even if the fungal infection is elsewhere on the body. Asteatotic eczema — This dry-skin eczema causes fine cracks in the skin, usually first involving the lower legs, where there are fewer oil glands. It commonly occurs in the elderly, especially during winter months spent indoors in a low-humidity environment. Stasis dermatitis — This type of eczema occurs on the calves, ankles and feet in people who have varicose veins or other conditions that lead to poor blood circulation in the lower legs. Leg swelling leads to itching, fine red bumps, skin darkening and, sometimes, ankle sores. Lichen simplex chronicus — This form of eczema is a reaction to repeatedly scratching or rubbing the skin in one location. A nervous skin-scratching habit can lead to thickened, discolored skin on the wrist, the ankle, groin or the back of the neck. Skin picking can lead to smaller bump-like areas of the same type of rash called prurigo nodularis. Seborrheic dermatitis (seborrhea) — Some doctors consider seborrhea to be a type of eczema, although it creates a greasier rash than is usual for eczema conditions. This scaly dermatitis commonly appears on the scalp as “cradle cap” in infants or dandruff in adults. It commonly affects the face or neck around the nose and at the scalp line. It probably is triggered by the skin fungus Pityrosporum ovale.